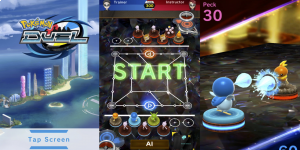 Pokemon Duel is a free-to-play strategy boardgame that is basically a mixture of chess, backgammon and Pokemon Go with elements of Magic the Gathering thrown in. In Pokemon Duel you get a set of six Pokemon and the objective is to get one of them to the central spot in the back row of your opponent’s side of the board while trying to protect your own at the same time. Moving your Pokemon around the board is just a case of tapping them and the battles involve stopping a spinning wheel which is marked with different moves and different size sections that correspond to the Pokemon you are using. How do you win Battles? How do you Evolve Pokemon? How can you get more Coins? How can you get more Gems? What are the Hotel Mission Rewards? No discussions open for Pokemon Duel at the moment.